Leading edge retouch | could this be Early Mesolithic on Teesside? The flint bits are white, a very pale hue. Is this the sign of an earlier crew? They’re bigger indeed, if I may be so bold. Is this the sign of something more old? Dear microburins, I promise work is proceeding on cataloguing the Late Mesolithic assemblages from White Gill, Westerdale and Glaisdale | see the previous post on “laying it all out“. It’s a slow process and some recent advice from a distinguished Pennine lithic guru—there are such things—means I need to do a little bit of back-tracking to add detail to some of the typological work. However, in a moment of nostalgia, I remembered a small, modest assemblage I found back in 1982 (while still at college) from a sandy rise next to some beautiful wetland ponds hidden amongst regenerating birch woodland, reeds and heather. It’s also great for woodpecker spotting when the off-road bikers allow some peace. It’s an odd spot. I find this place reminiscent of what the forested uplands might have looked like in the Mesolithic, and today deer roam amongst the trees and clearings—I’m the only wild boar. It’s all the more remarkable for being a nat’s whisker (a very short distance) from the outer edges of industrial Teesside—where the sky never grows dark: oil, gas and petro-chemical services vie for survival in an economically challenged region that never really recovered from the Thatcher years (1980s). How different (or not) from the 1880s when iron was forged and steel smelted. Sydney’s Harbour Bridge was made here, the place where the first commercial public steam railway ran from Stockton to Darlington. For whatever reasons, and there are many potential ones, the distribution of Early Mesolithic activity—whether assemblages or chance finds—in north-east England is not an onerous one on the eye. They are modest in number, away from the hubbub of Star Carr, Flixton and Seamer in the Vale of Pickering near Scarborough. There are a few noteworthy sites from the high moors, like Pointed Stone (Jacoby, in the Taylor collection but unpublished) and Money Howe (unpublished). Hints of earlier activity at Highcliff Nab, Guisborough (published) and some other “prominent” places in the landscape. These sites are characterised by “broad blade” microliths and obliquely blunted/truncated points. Compared to the veritable explosion of activity in the later Mesolithic—many hundreds of find spots—the earlier “period” is a rather spaced-out and ephemeral affair. The Late Mesolithic is itself typified by an increasingly diminutive “geometric” microlith toolkit. This included micro-scalene triangles, micro-backed bladelets, micro-tranchets and rods—some so incredibly small (hence “micro”) that you wonder if the folks were on high-strength herbal tea most of the time. Or something stronger. It all goes a bit strange compared to our bretheren in Nordics, Denmark, Netherlands and Belgium—perhaps as it remains to this very day? Now, part of the distribution bias will inevitably relate to taphonomic, survival, visibility and collecting factors. 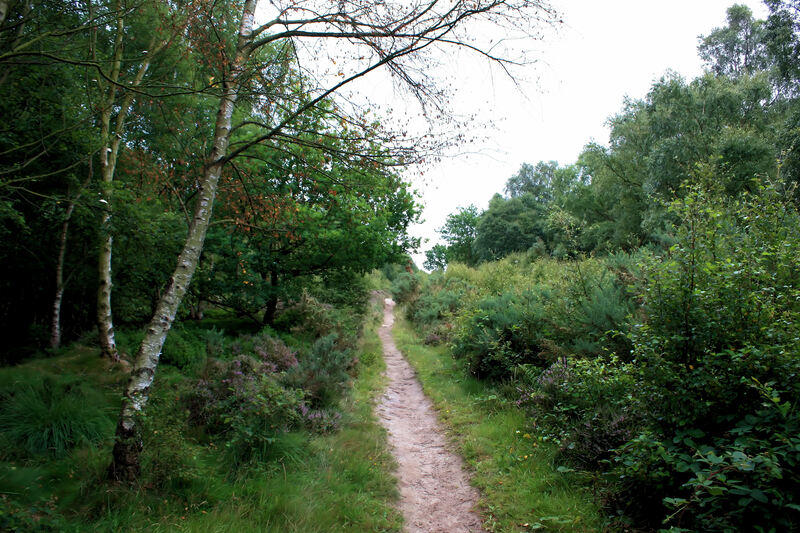 However, some folks comment upon how much attention Star Carr and Lake Flixton have received over the years as (dis)proportionate to the amount of attention given to the greater catchments, including the space between the lowlands and high moors—transit routes. My view is that we haven’t been looking systematically enough so far, but I also suspect that we wouldn’t change the maps radically, moreso because so much landscape sits under the sea, certainly south of Scarborough, or under millennia of alluvium and hillwash, or Teesside’s thick paleolake clays and steaming industry. The flint is more than 60% white, thought to originate from primary and secondary sources on and immediately around the East Yorkshire Wolds (south of Scarborough and Vale of Pickering) and the Lincolnshire Wolds (south of the Humber). Most assemblages from the north-east comprise of drift flint—battered beach pebbles (not beer battered as in fish & chips) and rolled rubble from river gravels. White flint is usually a small proportion of the North York Moors material. White flint on its own is not an indicator of Early Mesolithic by any means, but it is very unusual for the Tees area, and one of several suggestive indicators. The microlith and microburin, indeed the blades and flakes overall, are somewhat larger than what you normally find. Later microliths (and bladelets) are tiny affairs of only 3-5mm width, with occasional exceptions. This one is 11mm wide. 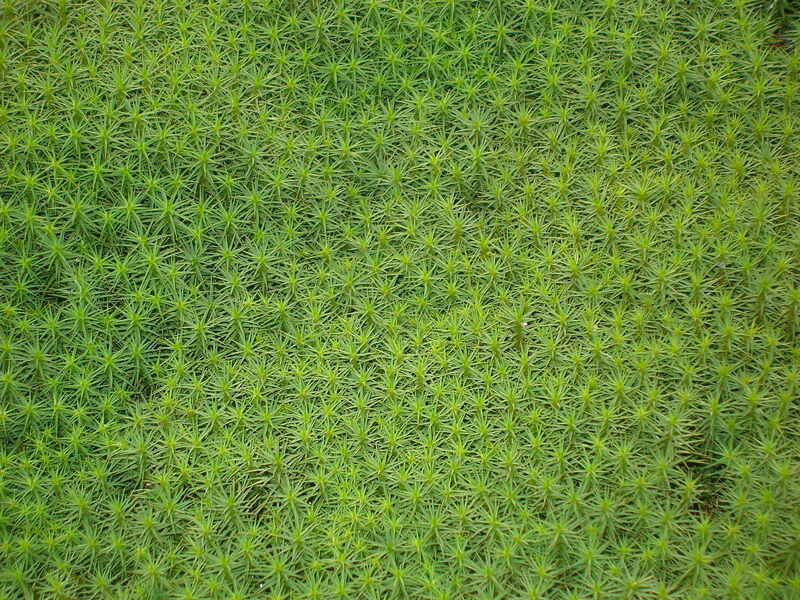 The microlith has a distinctive “non-standard” shape with steep retouch along the entire upper left edge and, importantly, similar retouch at the top of the leading (opposite) edge. It almost looks “shouldered” or tanged. And it’s white flint, not burnt. What I’m saying is it’s non-standard from a Late Mesolithic perspective. When compared with the individual and “large” straight-backed bladelets (only one edge), one each from White Gill, Esklets and Glaisdale, it is still broader by a few millimetres and significantly different in overall morphology. You might also notice the cheeky chunk of chert? There are two chert pieces in an assemblage of 48 pieces. Chert is extremely rare (exotic) in NE Yorkshire. Given that the uplands were not glaciated in the Late Devensian, a glacial till origin is less likely perhaps than some kind of human transience between the Pennines and North York Moors. Banded chert sources include Critch Hill in South Pennines Peak District (Derbyshire), Nidderdale in North Pennines (Yorkshire Dales), and is also noted in upper Weardale assemblages in County Durham with suggestion of a local source. The point is that all these places are many kilometers away. Even the Wolds are 30-40 km to the south. The site location is at a lower elevation than the high moor sites that are generally above 320m OD. Our sandy hummock is about the same elevation and not a disimilar topographic position as Deepcar (see more later)—coincidentally of course, but also occupies a locale not disimilar to those noted for Early Mesolithic presence in the Millfield Basin (Passmore & Waddington), with a preference for ponds, wetland catchments and escarpments. Carr Pond is close to a prominent escarpment overlooking the Tees estuary, similar to Highcliff Nab, and towards Hartlepool on the south Durham coast with its evidence for peat and forest beds in the intertidal zone—and dated evidence for later Mesolithic activity off today’s shoreline. There is a tendency for early Mesolithic “sites” to be in very prominent positions in the landscape, where distinctive topographic features are termed “handrails”—easier to find and remember as the forests took hold. Star Carr has a microlithic toolkit dominated by obliquely truncated, isosceles triangles and trapezoidal forms with retouch on one edge, not the leading edge. Deepcar also has obliquely truncated forms but with two general differences: there’s retouch also on the leading edges towards the tip and the microliths are generally more slender and longer, with fewer triangles and trapezes. Chronologically, and still challenged by a lack of fine resolution radiocarbon dating, it looks like Star Carr assemblages are earlier, with some overlap. So where could the Tees flints fit in? Could they be from this early “pre-Boreal” Mesolithic phase, something intermediary, or is this purely a flight of fancy? Slender obliquely blunted points with leading edge partial retouch at Deepcar, Yorkshire | Radley, J. 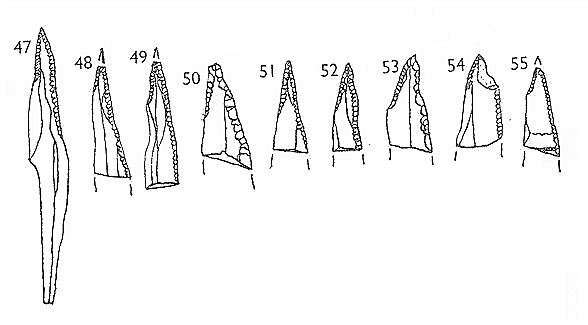 & Mellars, P. (1964) A Mesolithic Structure at Deepcar, Yorkshire, England, and the Affinities of its associated Flint Industries, PPS 30, 1-24. Fig 5 No 47 (tanged), also 48-50. 95% of assemblage was white flint with small proportion of black shiny chert and brown flint. Similar types from Central Pennines at Lominot (Fig 8 No 18) and Warcock Hill North (No 19). Slender obliquely blunted points, but without leading edge retouch, from Star Carr, North Yorkshire | Clark, J.G.D. 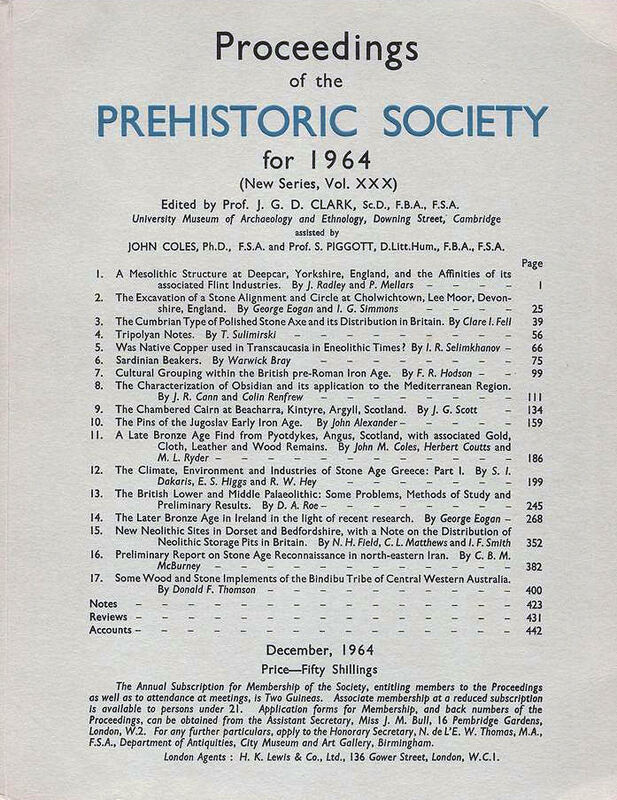 (1954) Excavations at Star Carr, an Early Mesolithic Site at Seamer Near Scarborough, Yorkshire, Cambridge University Press. Fig 35 No 30 (scalene triangle, noting the tapering distal “tail”) and the “irregular” No 27. To be honest, the Deepcar similarities, and dimensions, are closest, and closer than a Late Mesolithic typology. 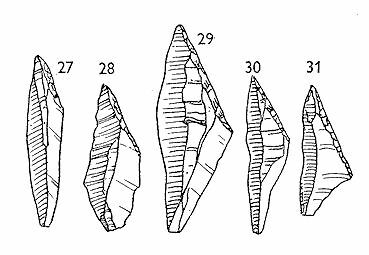 My submission is that this is a Jacobi Type 1b microlith | Early Mesolithic Deepcar Obliquely Truncated Point (the backing has modified the shape of the original blank). It’s missing 1mm from proximal tip, 3-8mm or more from distal “tail”. Original max length could have been 35-40mm. Compare with the largest Late Mesolithic straight-backed bladelets (SBB), e.g. Esklets, where the retouch is gently oblique to form a sharp point: L 32mm, W 7.5mm, D 2mm. The normal SBBs with a bit of leading edge retouch don’t normally form a “point” at one end, and typical dimensions would be L 20mm, W 2.5mm, D 1.5mm. Leading edge partial retouch on SBBs is not very common. am I early | am I late | what do you think? Adkins, R. and Adkins, L. 2008. The Handbook of British Archaeology (latest edition). Constable. Paul R Preston’s chapter on the Mesolithic is a good concise summary. 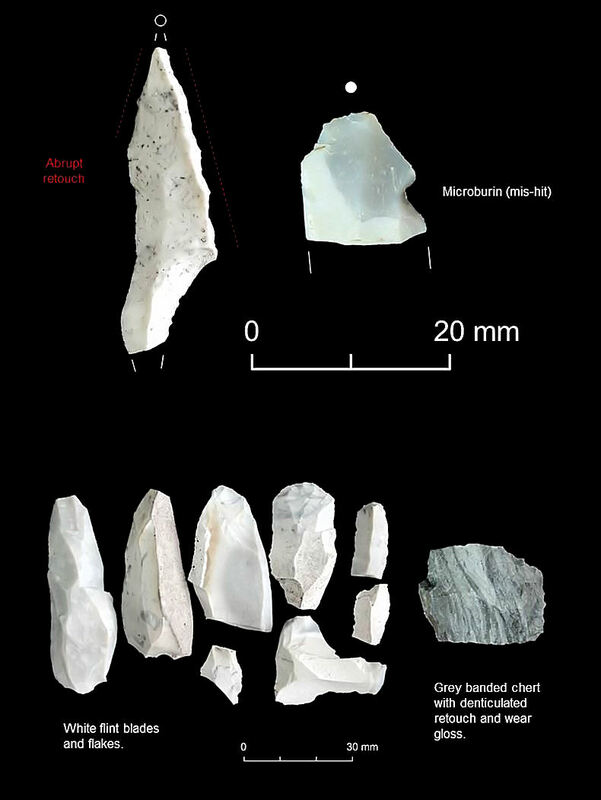 This entry was posted in British archaeology, Hunter-gatherer-fisher, Lithic analysis, Mesolithic, Sites and finds and tagged Archaeology, Boreal, Broad Blade, Deepcar, Early Mesolithic, Mesolithic, North York Moors, North Yorkshire, Star Carr, Teesside, Vale of Pickering by Spencer Carter. Bookmark the permalink.